It’s been another busy weekend here. Mr. C² took a much needed vacation day on Friday, so we were able to finish a few projects we had started that were on our to do list. 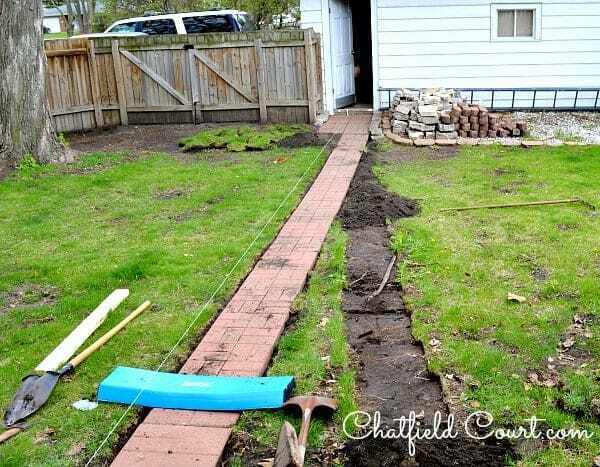 One of the items on the list was to move the existing crooked path of bricks that runs from the garage to the side of the house. When we moved in this path had these big white rocks alongside the bricks. They stuck up out of the ground, which made it impossible to mow around and they were a tripping hazard. Of course, the white rocks were removed right after we moved in but we didn’t fix the crooked path until now. See how crooked they are? And if you look closely along each side you can see where the white rocks laid. You can see the pile by the garage. the previous owners had them everywhere. 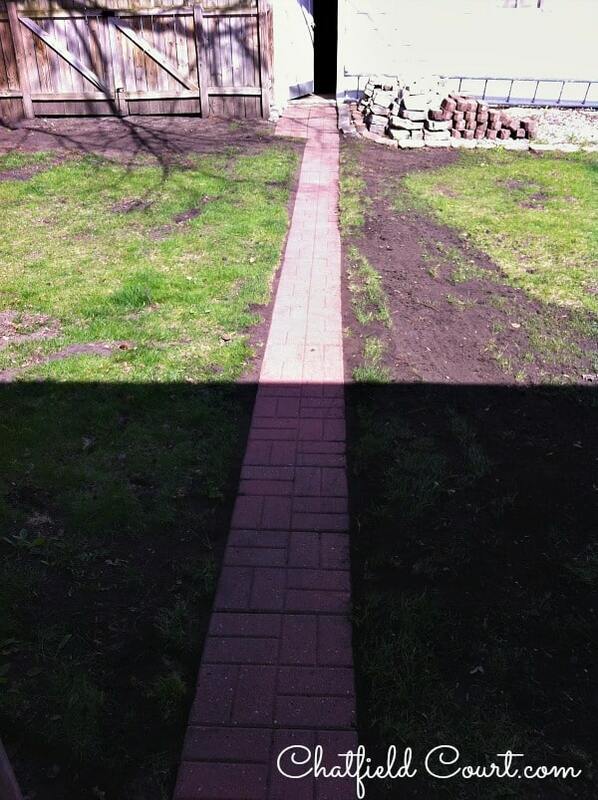 So the plan was to straighten out the path and to get rid of the pavers that were by the deck. We started this project a couple of weeks ago (before I painted the door) by using string to make a straight line from the garage to the house. Then, all of the pavers that didn’t fall under the string were pulled up (which were most of them). Mr. C² carefully dug up the grass, which was used to fill in some of the bare spots left from the old walkway, and placed the pavers in the new holes. He also used some of the topsoil that we still had left to fill in any low spots or holes. We still have more to do and the grass needs to grow in, but they are nice and straight and level now, which means there’s no tripping when you walk to the garage. 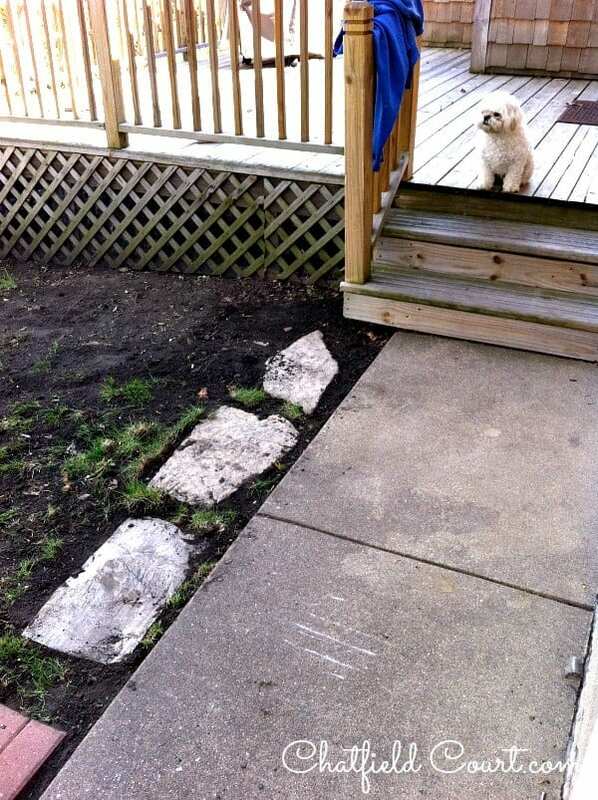 I found these large white rocks buried in the yard under old wood and bricks, so I had Mr. C² put them by the deck. I’m not sure they will stay but they are good for now since it is hard to grow grass in this area. We also finished our vegetable garden. We haven’t been able to have a good garden in almost 20 years, it’s really hard to grow veggies in Florida and Georgia, so we were excited to get one in. The spot we chose to put it in is next to the deck since it gets a lot morning and early afternoon sun. There was some fun this weekend, well I had fun while Mr. C² grumbled about eating and being hot. We went to the Kane County Flea Market. It was hot and dusty but wow, there is so much to look at. I think you could find anything you wanted there and some of the prices are really reasonable. 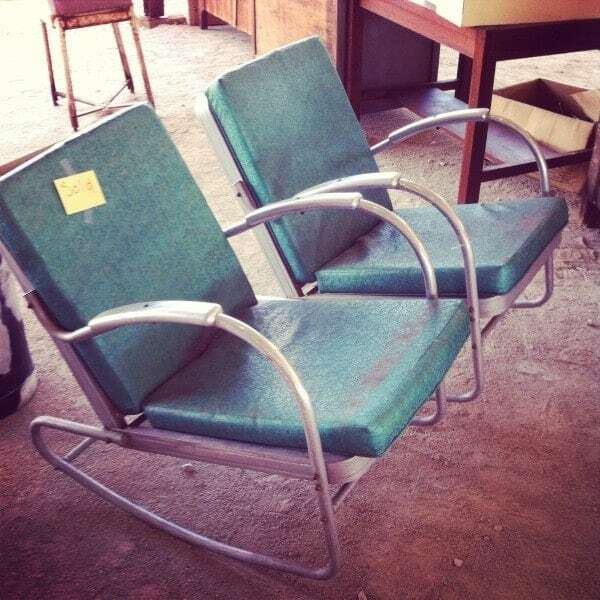 If you follow me on Instagram you would have seen some of the great items I saw like these fabulous old rockers that were in really good shape. Everyone that passed by looked at them. As you can see they were already sold, and not to me. 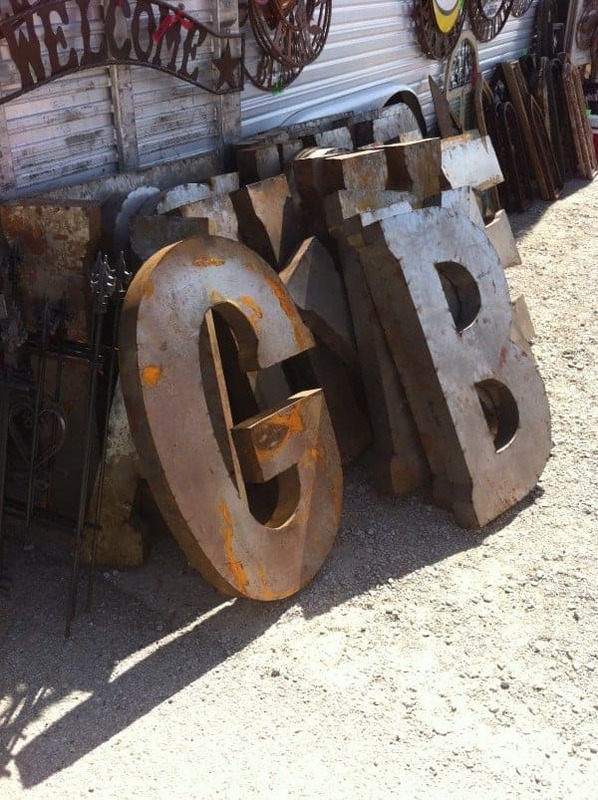 These large metal letters were fun and rusty and $50 each. 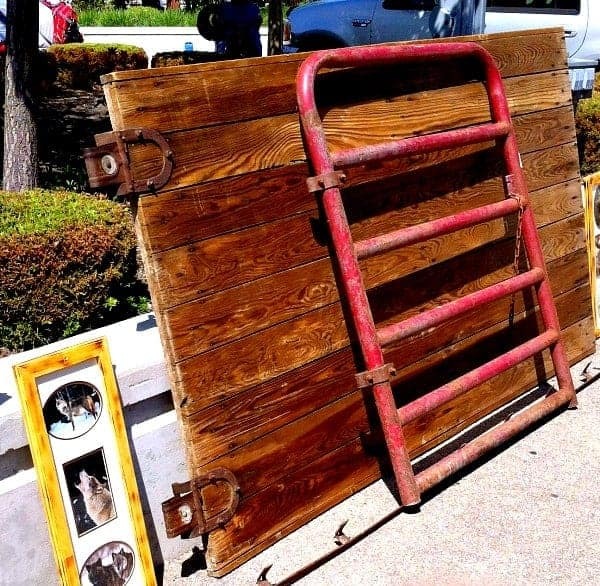 I also saw this old barn door, with rusty hardware and beautiful wood. Right after I snapped this photo though, it was taken away to go to its new home. Like I said, there is so much to see. The only thing I ended up buying was some plants to replace the 60 year old junipers in my front flowerbed. I had been looking for boxwoods at the nurseries in my area and haven’t been able to find what I wanted. I found them at the flea for $14 a piece (3 gal. I think) and some hostas for $5 a piece. Great prices. They hold this flea market once a month so if you’re ever in the Chicago area and they are having it…go! That was my weekend. They seem to go by so much faster than the week days don’t they? What did you do this past weekend? 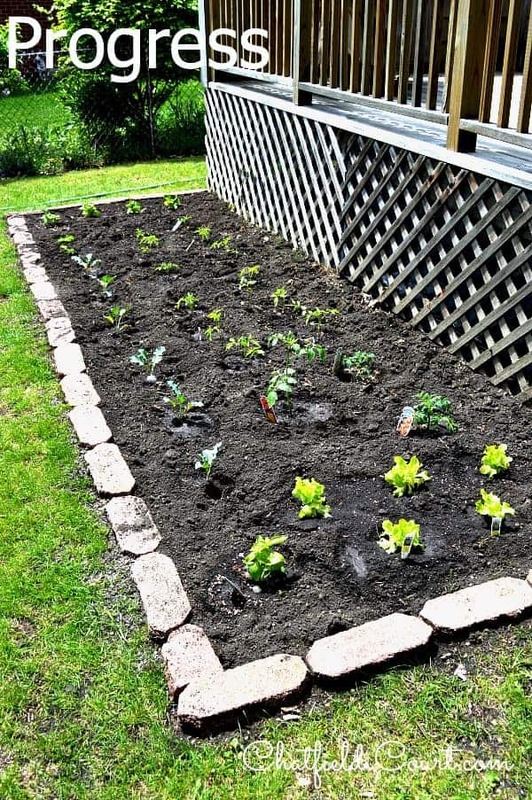 Have you planted a vegetable garden? Come check out the latest on FACEBOOK and PINTEREST and TWITTER. Your walkway looks great. Always good to get projects like that done. I’m sure your vegetable garden will give you much produce. Hi Mary Alice. It is so good to get a project like that done, but there’s 15 more right behind it. ;) I hope we do get some good produce, at least. Thank you for your visit and comment. Loved your guest bedroom makeover! Kristi, I can’t believe how crooked your walk was! 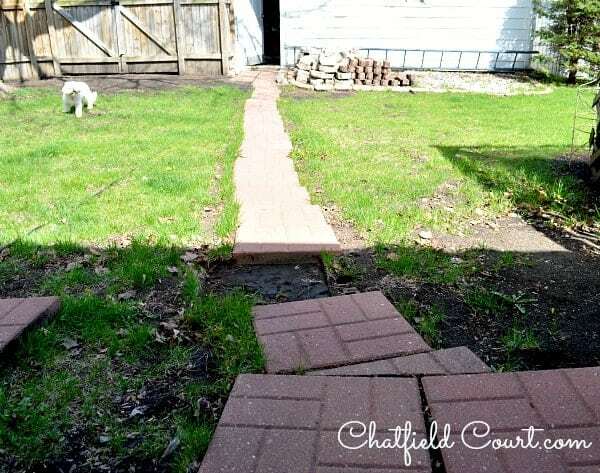 I had to laugh when I saw the straight line of pavers that you and hubby laid down. Looks really nice now. 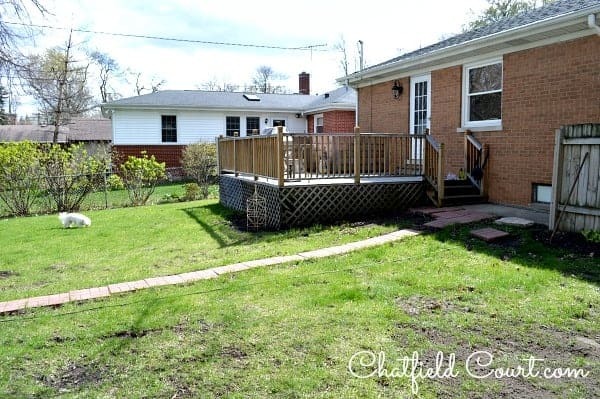 It seems that you have a fence around your yard. In my neck of the woods (literally, we have a woods at the back of our property) I have a problem with deer and rabbits. I have a fence around my little raised bed garden because if I don’t the deer will eat all my pepper plants and the rabbits will eat all my lettuce! As it is the deer started to eat my hostas! I spray with a organic spray for deers and other animals and it does keep them away, but I neglected to spray by the patio where some of my other hostas are and guess what, yea, they practically chewed every leaf! Well, you can guess what I was doing this weekend, spraying and working on the garden and other landscape work. It never ends, but I enjoy it! Looking forward to see more of your work around your home. Hi MJ. It was very crooked. I’m not sure what they were thinking when they did it. I do have a fence around my yard but we still have a critter problem (skunks, possums, fox, rabbits, raccoon) and we aren’t in the country. We are worried that our garden will get eaten before we can get any good veggies, but our neighbor has grown a garden for years and she said that the only things she has trouble keeping are peppers. We’ll see what happens. So sorry about your hostas, hopefully the spray will continue to work. When we lived in PA we had a terrible problem with the deer eating anything and everything. So frustrating. Thanks so much for taking the time to visit and comment. I always appreciate it.